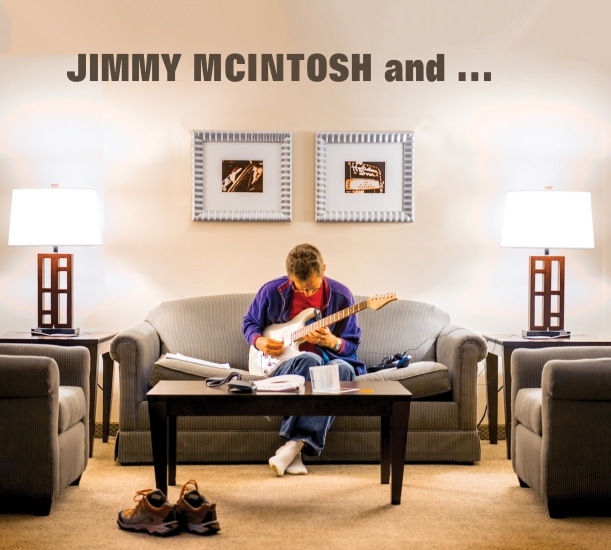 Las Vegas Guitarist Jimmy McIntosh Releases New Album Featuring Rolling Stones’ Ronnie Wood! Las Vegas, NV – As a follow up to 2006’s ‘Orleans to London’, guitarist Jimmy McIntosh once again finds himself in illustrious company on his new album ‘Jimmy McIntosh and…’ This collection of funk, rock, jazz and blues originals showcases McIntosh’s considerable six-string prowess and features the Michigan native exchanging incendiary licks with his personal guitar heroes John Scofield , Mike Stern and the Rolling Stones’ Ronnie Wood. The solid backbeats are supported by Toss Panos (drummer of choice for guitarists Robben Ford and Mike Landau), bassists Dan Lutz, John Humphrey and Keith Hubacher and New Orleans keyboardist Ivan Neville (of The Neville Brothers, Keith Richards’ X-Pensive Winos and Dumpstaphunk). This stellar outing was definitely a labor of love for McIntosh. McIntosh’s friendship with Ronnie Wood goes back to his solo debut, ‘Orleans to London’. Jimmy recalls, “I first met Ronnie backstage at a Stones show in Las Vegas. Ronnie and Keith Richards were hanging out with Bobby Womack in the ‘Tuning Room’ were they Jam to warm up before the show. Art Neville did me a huge favor and called Jane Rose for me to meet Keith and Ronnie. It was a wedding gift as I got married a week before (This was April 1999). Anyway a few years later I recorded my first CD ‘Orleans To London’ and Art Neville, Ivan Neville, Cyril Neville and Mean Willie Green (Neville Bros drummer) played on it. As I was near the end of the project in October 2004 I got in touch with Ronnie Wood through his stepson (Jamie Wood) who was his manager at the time and told him about my project. Three weeks later my wife and I flew to London and went to Ronnie’s house in Richmond were he played on 5 tracks (first takes). Ronnie said, ‘I told Jeff Beck about your project and he might come by to play’ – I was in shock! About 2 hours later Jeff showed up and ended up playing on 3 tracks. Ronnie said as Jeff was recording, ‘You can’t believe how lucky you are, he won’t play on anything!’ I’m not sure what Ronnie told him about the Neville’s being on the record but it was amazing having both those guys on the record. Jeff is credited as ‘Hot Rod’ on ‘Orleans To London’ because his manager wouldn’t let me use his name.